I am just worried bcoz I am still confused with my levels!! 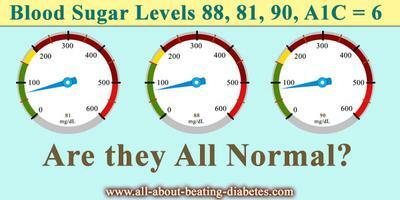 My blood sugar levels are normal!! And my a1c is 6. So what does it indicate?? Why my levels are normal and a1c is 6?? Something interesting, which has to be mentioned is that not only the results of your blood glucose are normal, but even the result from your HbA1c test. I'm saying this, because the normal HbA1c value is fewer than 6.1% and in some laboratories even fewer than 6.5%. However, it is true that it can be lower and there are several reasons, which can lead to minimal elevation in the blood glucose concentration. The most probable explanation is well-controlled diabetes. The interesting fact is that you haven't mentioned anything about being diabetic. The other thing which is in my mind is why you are performing the A1C test, if you don't have diabetes. I can suppose that you are worried about developing diabetes and I will inform you that the blood tests are not the only thing, which will help you to diagnose diabetes as early as possible. There are early symptoms of diabetes, which are drinking a lot, frequent hunger and visiting the bathroom 7-8 times, in purpose to urinate a lot. If you notice some of these symptoms, you are obligated to inform your doctor immediately, because he/she will be able to define the exact cause of these symptoms. I think that you don't have diabetes, because all of your parameters are normal and you haven't mentioned anything about the early symptoms of diabetes. Besides, if you are diabetic, the control of your diabetes is very good. Other possible reason for a minor elevation is the consumption of Vitamin C. The bad thing is that I'm not able to explain you the exact mechanism, but this is the result. However, certain blood diseases are able to elevate the A1C a little bit, but we are not able to discuss this in here, because they appear during the childhood. Regarding how the A1C is formed in the organism, you have to know that the normal human hemoglobin sticks to the molecule of glucose. This also called glycated hemoglobin is formed naturally, but more of this hemoglobin is produced, when there is more glucose in the blood- hyperglycemia. Hyperglycemia is observed mainly in patients with diabetes, so you can see by yourself why this parameter is measured mainly in diabetics. However, regarding your condition you have to know that everything is fine and there is nothing to worry about. If you are still afraid of developing diabetes in the future, continue with the blood glucose test and look for the early symptoms. In this way everything is going to be perfect, just like now.